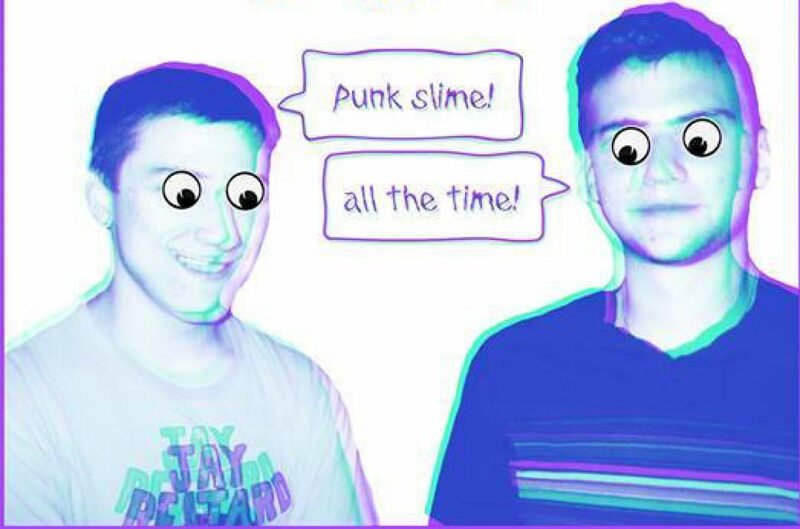 This is a review of two different shows that took place one after another on the same night at the same venue (Lilypad).The first is a review of Fume Hood, Thick Shakes, and Fat Creeps and the second is a review of Hassle Night # 9 featuring Secret Lover, Extreme Animals, and JUICEBOXXX, though we missed Juice :(. Fume Hood – It’s my first time here at the Lilypad. It’s a sweet little spot; art gallery, no stage, tiny bar, there’s something charming about it that I haven’t put my finger on yet. Not the best space I’ve seen for a crazy rock ‘n’ roll show per se, but a fairly comfortable, fun, fitting place for an underground music show, if you will. Glen says it reminds him of the 119 Gallery in Lowell, but I disagree. I think he was too fucked up to remember what the 119 Gallery looked like the last time we were there – it’s okay, I was equally shitfaced myself, but that’s a whole other story. We’re here now at the Lilypad and Fume Hood is playing (pretend that they are playing in front of you, use your wonderful imagination). The first and last (up until now) time we saw Fume Hood was at the Boston Underground Summit this past September at the Cambridge Elks Lodge. With that show we only got a taste of the Fume Hood, we got teeny flashes of the fume because it was a round robin set – up, so we only heard one song at a time, ya dig? Tonight’s show is a standard back to back performance. I have to say I preferred them last time and this could be attributed to the fact that they are missing their lead singer. Or, I just have a really short attention span. A solid combo of both. Fume Hood is fairly strange and psychedelic for lack of a better word. A bit experimental, artsy at times. Perhaps music that’s better if you’re really high, but then again what kind of music isn’t better when you’re high? Fume Hood’s set also includes some special guest vocals from Gracie Jackson (Fat Creeps). Is dis a sign of future collaborations? We’ll just have to wait and see. Thick Shakes – It’s been a while since we’ve seen our local Thick Shakes. Last show was at the Precinct in the Summer of Twenty Twelve. What a grande olde tyme. But, we go even further back with the Thick Shakes. Nearly three years ago we caught the Thick Shakes at the Dirty Douglas in Lowell, in fact that was our first basement show. A straight up surreal introduction to this weird, wonderful world of underground rock ‘n’ roll. Even more fitting is Thick Shakes’ grasp on garage rock ‘n’ roll; they lean towards the dirtier, noisier side of the rock ‘n’ roll spectrum and that’s what we love. 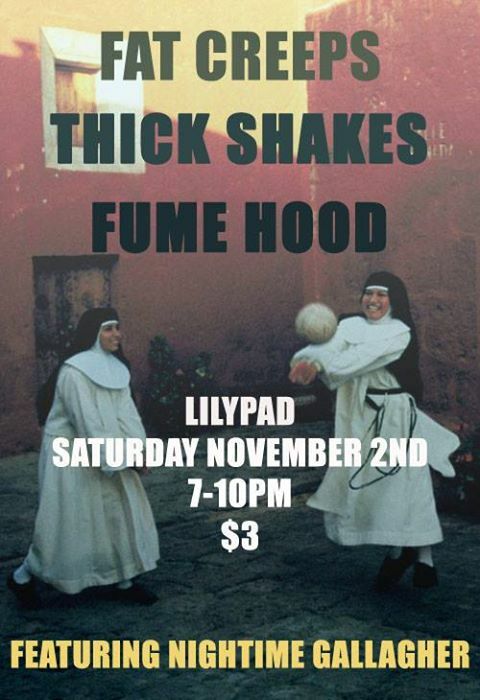 I honestly haven’t listened to Thick Shakes in a long time, so I am not all too familiar with their songs. But, my memory serves me right and they are still the same old garage punk band as I remembered. Fast, head banging, hip shaking, slimy punk jams. Though, they are missing an organ player, a key ingredient in the Thick Shakes plate. Fat Creeps – I really wish I was drunk right now to write the rest of this. I’m just not feeling it anymore. I wish I was as drunk as I was when I saw this show. I’m sure they played “Nancy Drew” and “700 Parts” and a bunch of other songs, and I’m sure we all had a blast. You can thank Mr. Melody Matters for capturing the lovely, feed backy, “Going to the Party” on video below. Fat Creeps have a new drummer named Chris Geller and he does a sound job with all of the Creeps tunes. Give him a great big kiss when you see him at the next show. Secret Lover – I seem to be seeing Worcester’s Secret Lover a lot lately. I usually see them in basements, but the Lilypad works just as well. I can imagine no setting would be too big or small for lead singer Sally. Sally is one of the most exciting performers I have come across. I just adore the way she delicately darts out into the crowd and passionately sings every word. You can tell she loves what she’s doing and loves to get people dancing.